Copper high quality statue with 'cold' gold painted face. 4 inches high. Embodiment of the transcendental wisdom of the Buddhas. 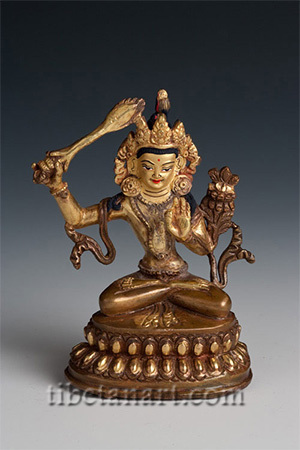 His right hand holds the sword of wisdom that cuts through ignorance and his left holds a lotus on which rests a Prajnaparamita text.